High-quality HDR monitors remain rare in today's PC market, remaining exclusive to ultra-high-end panels while most manufacturers avoid OLED screens over fears of burn-in issues. Mini LED is a new technology which is designed to make high-quality HDR easier to achieve on PC, utilising small LEDs (as the name suggests) to offer backlighting capabilities that extend beyond most FALD (Full-Array Local Dimming) setups. 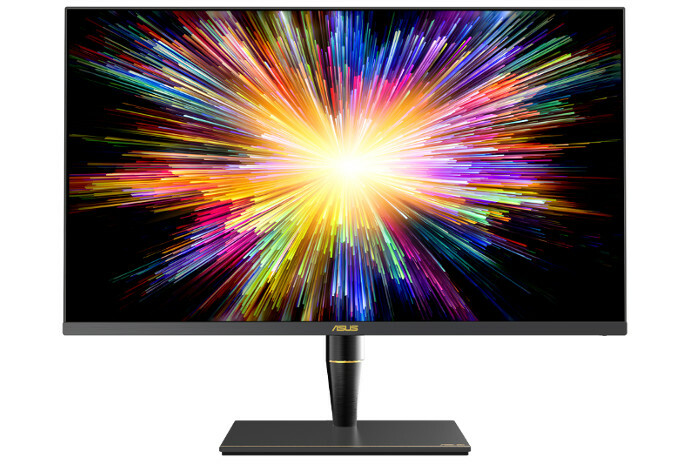 ASUS revealed their 32-inch ProART PA32UCX 4K mini LED monitor at CES 2019, but now the company has revealed their smaller 27-inch variant, the ProArt PA27UCX, which retains the same 4K resolution as its bigger brother and its mini LED backlighting setup. What changed with the PA27UCX is that this smaller monitor only features 576 local dimming zones, rather than the 1,000+ that are available on the 32-inch PC32UCX. This change is likely due to size constraints, though it is worth noting that 576 lighting zones represent a 50% boost over what is available on Nvidia's 27-inch G-Sync Ultimate HDR monitors, which feature 384 local dimming zones. When it comes to HDR support, ASUS' mini LED panels pack support for VESA DisplayHDR 1000, 10-bit colour, support for the DCI-P3 and Rec. 2020 colour spaces and supports HDR formats such as HDR 10 and HLG. The display also supports HDMI and DisplayPort over USB-C for connectivity. Full DisplayPort support is also expected, but ASUS' official listing for the ProArt PA27UCX remains basic and lacks a lot of detailed information. Given the fact that the PA27UCX is a ProArt series monitor with high-end HDR capabilities, you can guarantee that this monitor will ship with extremely high pricing levels. Even so, Mini LED technology will likely see wider adoption in the coming years, especially as the new backlighting type becomes more widely used and manufactured. You can join the discussion on ASUS' ProArt PA27UCX 4K HDR Mini LED Monitor on the OC3D Forums.